From the beginning the reader learns Aurelia’s intentions and feelings. Although she does act, at times, scandalously, it is hard to see her in the bratty light that Max continuously paints her in. Max himself comes across as standoffish and emotionally unavailable, though why is a major premise of the plot. Many other reviews state a dislike for the two main characters, but I found them amusing and rather realistic. One thing I certainly did not like was the several grammatical errors throughout the novel, however, they in no way made the book unreadable/unenjoyable. This book moves fast, and is hard to put down, because there is always another thing that HAS to be known/resolved before you can start doing something else. 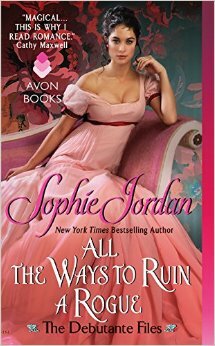 Sophie Jordan grew up in the Texas hill country where she wove fantasies of dragons, warriors, and princesses. A former high school English teacher, she’s also the New York Times and USA Today bestselling author of Avon historical romances. She now lives in Houston with her family. When she’s not writing, she spends her time overloading on caffeine (lattes and Diet cherry Coke preferred), talking plotlines with anyone who will listen (including her kids), and cramming her DVR with true-crime and reality-TV shows. Sophie also writes paranormal romances under the name Sharie Kohler.